Awards & Memberships of Attorneys at Faiella & Gulden, P.A. This invitation-only group is limited to 100 members in the United States—the very best of the best plaintiff lawyers. Elizabeth H. Faiella of Faiella & Gulden, P.A., is proud to be a member. Elizabeth H. Faiella was nationally board-certified in 1984 by the National Board of Trial Advocacy in Civil Law. Formerly the National Board of Legal Specialty Certification, this non-profit organization was founded in 1977. Peter J. Gulden III was featured in Orlando Style Magazine in 2014 in a profile of Orlando’s Legal Elite. He discussed his work as a medical malpractice attorney, and why he does the work he does. Elizabeth was selected for inclusion as a Medical Malpractice attorney and as a General Personal Injury attorney, from 2009–2012 and 2014–2017. Super Lawyers® is a rating service that ranks outstanding lawyers through nominations, peer evaluations, and independent research. 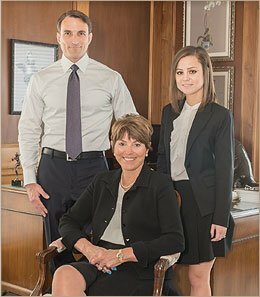 Both Elizabeth Faiella and her son Peter Gulden have been favorably reviewed on Martindale.com, a lawyer ranking and peer review website that works to connect potential clients with skilled attorneys. Elizabeth H. Faiella has been recognized as one of America’s Most Honored Professionals. This award from American Registry takes into account repeated, authenticated, publicized honors from the press, peers, trade groups, and clients over a five year period. Ms. Faiella was in the inaugural group of professionals honored with this award, in the Top 5% for 2011–2012. Since 2010, Elizabeth Faiella has been rated AV Preeminent® by Martindale-Hubbell, the oldest legal information service in the United States, founded in 1868. This honor comes from a combination of peer reviews, ethical standing, and in-depth research. These are the top trial lawyers in America, who win million-dollar settlements and verdicts for their clients. Elizabeth Hawthorne Faiella of Winter Park, Florida, is one of them. Peter J. Gulden III is a lifetime member of the Multi-Million Dollar Advocates Forum, an organization with membership limited to attorneys who have won or settled cases for millions of dollars. In addition to chairing the Women’s Caucus, Elizabeth H. Faiella has served as a lecturer, panelist, workshop leader, and author, nationwide, since 1981; lecturing on such topics as Voir Dire, Opening Statements, Cross-Examination, and Closing Arguments. In 1980, only 8% of practicing attorneys were female. Orlando Home & Leisure, along with Martindale-Hubbell, decided to recognize the very best female attorneys. Ms. Faiella was named to this list for Premises Liability in 2011, and Litigation in 2012. As published in Orlando Life magazine, Elizabeth was given the title “Orlando Top Lawyer” for 2010, 2011, 2013, and 2014. These peer-rated lawyers had the highest levels of ethical standards and professional excellence in the Orlando area! Since she was first licensed in 1976, Elizabeth H. Faiella has been an active member of the Florida State Bar. She is board-certified in Civil Trial Law and has been since 1983. Peter J. Gulden III and Rebecca Gulden are also active members, and have been since their licensing in 2005 and 2015, respectively. In addition to being able to practice law in Florida’s state and federal courts, Peter J. Gulden III is qualified to practice law in Washington, D.C.
Peter Gulden is a member of the American Society of Bioethics and Humanities. Peter Gulden is a member of the American Society of Law, Medicine and Ethics. Both Elizabeth H. Faiella and Peter J. Gulden are members of this invitation-only specialty group, established by the National Trial Lawyers organization. Membership is limited to the top 25 trial lawyers in each state, and based on reputation, achievements, and board certification in medical malpractice. When you want to make sure victims are getting justice, you need to get local. Elizabeth, Peter, and Rebecca are active members of the Florida Justice Association, whose mission is to represent average citizens in the Florida Legislature and the courtroom. As medical malpractice attorneys, we couldn’t agree more, and do everything we can to promote our clients’ interests. Elizabeth, Peter, and Rebecca are proud members of the American Association for Justice, an organization formed specifically for and by trial lawyers. Founded in 1946, the AAJ is dedicated to justice through holding corporations accountable, advocating for fairness in American courts, and educating fellow lawyers in how to provide the best service to their clients. Faiella & Gulden, P.A. is a Better Business Bureau "A+" rated law firm. Businesses are graded based on 16 elements including: Time in Business, Competency Licensing and Background Information.